Mt. Oliver Borough was incorporated in 1892 and with more than 125 years of history as an independent Borough, Mt. Oliver has maintained many of the same values since its founding. Most notably, the community has a certain sense of pride and independence that is deeply rooted in the Borough’s history, which you can read about below. Fast forward to the present-day and you will find that Mt. Oliver Borough is a largely residential area with single-family homes and an old-fashioned main street dotted with locally owned and operated enterprises. Mt. Oliver boasts two neighborhood parks that accommodate a wide range of recreational activities and community events. We like to think of Mt. Oliver as the perfect mix of old and new, of urban and suburban, and a special place that never fails to inspire with its hometown charm. Mt. Oliver was founded by John Ormsby in 1769, when Captain Ormsby, an officer under the command of General Forbes, was granted 249 acres in an area located in the south hills along the banks of the Monongahela River. In 1788, Allegheny County was formed and divided into seven townships: Moon, Mifflin, Elizabeth, Versailles, Plum, Pitt and St. Clair. Mt. Oliver was a part of St. Clair Township. In 1800, John Ormsby began selling plots of land in Mt. Oliver and by 1830, most of the population in Mt. Oliver owned their land and paid property taxes. That same year, St. Clair Township was divided into Upper St. Clair and Lower St. Clair boroughs. The Mt. Oliver residents attempted to incorporate but the state ruled against the effort. The property owner quota was not sufficient to award incorporation. Thus, Mt. Oliver became part of Lower St. Clair Borough. By 1870, some 40 years later, Pittsburgh had annexed the boroughs of South Pittsburgh, Monongahela, Allentown, Lawrenceville, Temperanceville, Birmingham, Mt. Washington, West Pittsburgh, Pittsburgh Borough, East Birmingham, St. Clair Borough and Ormsby. Mt. Oliver residents had long felt that their people were not being dealt with fairly. When St. Clair officials appropriated funds for road improvements or public safety, Mt. Oliver was last on the list. By 1891 a few prominent Mt. 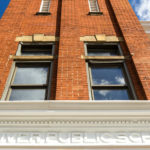 Oliver businessmen took a re-count of the population and property owners and decided that the results would warrant a second try at incorporation. In 1892 a petition was signed by 650 property owners to incorporate Mt. Oliver into an independent borough. The petition passed the courts and on November 9, 1892 seven businessmen and a judge met at the old schoolhouse (Pittsburgh Federal Credit Union rear parking lot) and signed the incorporation documents. The original 294 acres that John Ormsby purchased were set as the boundaries for Mt. Oliver Borough and remain the same today except for Giffin, Rustic, Onyx, and Quincy. The first minutes of the Mt. Oliver Borough Council meetings show how dedicated the officials were to the improvement of Mt. Oliver. Streets were established, houses were numbered, and sewer systems were installed. All seemed to be going well for the newly established Borough until 1927 when the City of Pittsburgh attempted to force annexation. By that time, Pittsburgh had annexed the boroughs of Knoxville and Carrick. Mt. Oliver was now that last Borough left, completely surrounded by the City of Pittsburgh. Pittsburgh had its legal department research a way to force Mt. Oliver join the City. However, Mt. Oliver had its own team researching, as well. Burgess Charles Beckman, the Borough Council and Solicitors came to the conclusion that with their population of 7,000 in that year, there were no legal grounds to force the annexation of Mt. Oliver into the City of Pittsburgh. A letter was drafted and hand carried to the Pittsburgh Mayor informing him that Mt. Oliver would remain an independent municipality. As a matter of fact, they gained in the Carrick annexation as they were given the previously mentioned avenues of Giffin, Rustic, Onyx and Quincy.